It was surviving a brush with adversity that allowed Anisa Telwar's business to really grow. The owner of a successful US cosmetics company, back in 2002 she was hit by a development which threatened the firm's future - her long-time South Korean manufacturer announced that he was ending their partnership and going out on his own. Ms Telwar suddenly found that her Atlanta-based business Anisa International - today one of the world's largest designer and manufacturer of make-up brushes - had nowhere to get its products produced. Describing the situation as "pretty scary", and faced with the possibility of her business having to shut down, she instead determined to fly to China and secure her own factory. The Anisa International plant, based in the city of Tianjin in northern China, now makes more than 25 million make-up brushes per year. Ms Telwar, 48, looks back on the split with her former South Korean partner as being like the break-up of a marriage - yet one with a happy ending. "It was a bit like a divorce," she says. "But at the end of the day, it was probably one of the best things that ever happened." Owning her own factory meant that she took full control of the manufacturing process, allowing her to design new products more freely, she says. And thanks to this newer, wider range of make-up brushes, Anisa International's sales have increased substantially. Today, the company has annual revenues of more than $30m (£18.5m). It is a "white label business" in that it makes its make-up brushes for other firms, including many of the big names in cosmetics, such as Estee Lauder and Sephora. 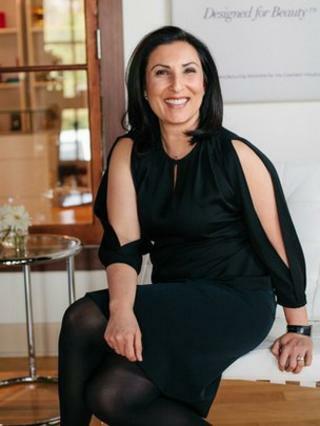 Born in New York, but raised in Nashville, Tennessee, Ms Telwar undoubtedly gets some of her business drive from her Russian mother Fatima Telwar, who after a childhood in Turkey emigrated to the US. Fatima Telwar ran her own import and export business, buying general goods in the Middle East, such as rugs, and then selling them in the US. After two years at business school, Anisa Telwar joined her mother's business when she was in her early 20s. The decision to go out on her own came after a meeting with the fateful South Korean manufacturer, and Anisa International was born in 1994. While the Korean firm would make the brushes, Ms Telwar would do the distribution, marketing and selling - jobs it was soon apparent that she was rather good at. While she had little capital to put into the business, Ms Telwar instead said she was determined to both work hard and think creativity. "I had my sweat equity, and I had some marketing savvy on how to sell these brushes differently," she says. To do the later, Ms Telwar went to visit the big cosmetics firms, and got them to think more about how well a certain brush worked with their product. Whereas previously make-up brushes were not given much attention, Ms Telwar got the firms to focus on what softness, texture or size of brush worked best with a particular foundation powder, or eye shadow, or other such cosmetic item. It soon led to Anisa International picking up orders. The company now employs more than 500 people, across its manufacturing base in China, its headquarters in Atlanta, and offices in New York and London. Ms Telwar says she remains as passionate as ever about the business. "This industry excites me," she says. "When I was younger I really wore a lot of make up, I see how it can enhance, how it can improve, how it makes women feel. "This is a luxury type item that makes us feel good. I connect to that a lot." As well as her general leadership duties, Ms Telwar keeps a close eye on make-up trends to look for new ideas. She says she mines magazines and social media sites. "That's my role, I feel, in this organisation," she says. "I am supposed to find the trend." Ms Telwar is also happy to speak to experts, such as her 15-year-old niece. Recent new product developments include nail painting kits. The company also continues to develop new types of manmade fibres for the bristles in its brushes. "I love the idea of designing something new that can be dynamic and visually beautiful." says Ms Telwar. As the company prepares to move to a bigger head office across town in Atlanta, she says she continues to ask that all new recruits are creative people. "I do look for people who have creativity, no matter what," she says. "Because you can be creative in finance, you can be creative in admin. "I look for people who want to follow our vision in this industry, that want to be part of the team."